THEY FINALLY MADE ME SICK ENOUGH! There were more than a few highlights for me at the meeting last night. 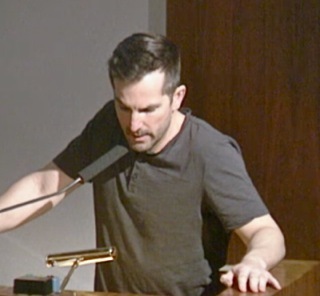 One of which was almost Parks and Recreation Commissioner and City Council Candidate Julie Mercurio, who was perched in the back row with the ever-strange Doug Vogel, getting a stern warning from the sergeant at arms for.... wait for it.... clapping! I'm sorry, but I couldn't help but smile. Maybe her little fingers got tired from texting during the meeting, because she and her sidekick bailed out not too much later - apparently making a token appearance is enough for her - she doesn't really need to know the issues, after all. Somebody will tell her what to think. 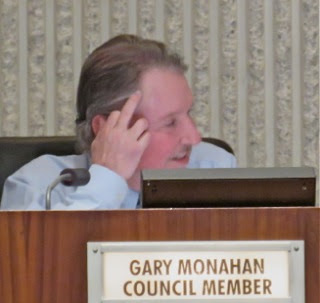 Another highlight - and I REALLY love this one - was lamest of lame ducks councilman Gary Monahan trying to be clever by giving me the finger as I photographed him. Well, dude, here it is, for all to see. That second image was taken four seconds later. I'm trying to figure out if he was drunk or just stupid last night... maybe both. 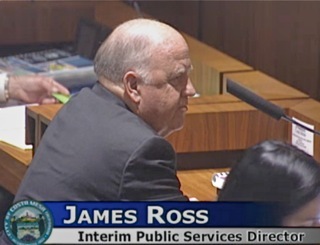 At the very beginning of the meeting CEO Tom Hatch introduced Jim Ross, the Interim Public Services Director. His credentials were quite impressive, including a tour at Santa Ana as Executive Director of Public Services. He is a temporary replacement for the departed - and much missed - Ernesto Munoz. During Public Comments a dozen and a half people rose to address the council on a variety of issues. I'm not going to address every person's comments, but will include a few to give you the flavor of the evening. Ever faithful Chuck Perry,(no image) Tea Party Tom Pollitt and new council majority sychophant Jim Kerins presented themselve to praise the council for all the great things they've done. You'll recall Kerins recently suggested that us old people should just move on and leave the city to the younger folks. Sure tested my gag relfex. By the way, Mensinger re-started the clock for Kerins about a minute in, so he actually got 4 minutes, not three. Guess that happens when you're a FOS - Friend of Steve. 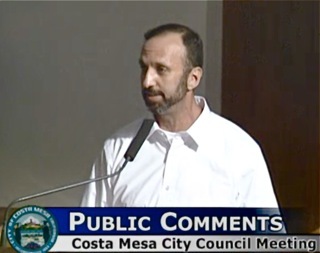 Alex Reich cover a number of issues - and got Mayor Steve Mensinger mad at him along the way. He observed about checks being lost in the mail - that's from the Warrant that never did get vetted last night. 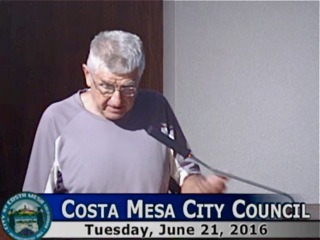 He started to make a point about Fairview Park but Mensinger tried to interrupt him. He and Righeimer do that all the time - they interrupt and distract speakers from their message and think just because they restart their time everything is just dandy. It's not! Reich also observed that there seems to be a rush to complete the General Plan. Always steady and always courteous Beth Refakes address fireworks over the upcoming July 4th holiday. 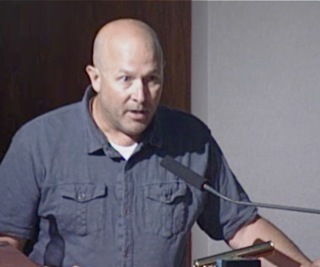 Council candidate Jay Humphrey presented a slide show of people performing a variety of jobs that he ended up saying probably couldn't afford to live in Costa Mesa if the current high-end building avalanche continues. 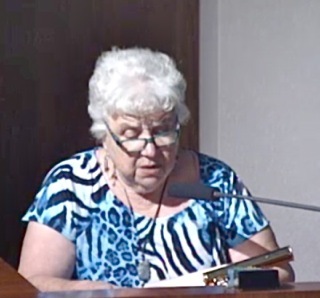 Teresa Drain observed that we have a wonderful community, full of alert folks who see things happening and bring them to the council for discussion, however, many times folks are treated rudely by folks on the dais. 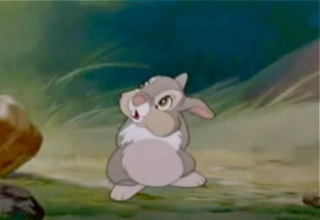 She then played a very short video clip from the Disney movie, Bambi, in which the bunny, Thumper, is cautioned about manners. We probably should have replayed that several times throughout the evening. Mary Spadoni chided the mayor for his misrepresention of her comments and read from a letter she submitted to the Daily Pilot. The mayor was NOT happy. 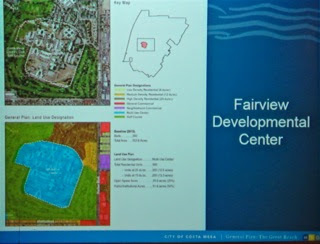 Kim Hendricks spoke of Fairview Park and the telephone survey conducted about the park. 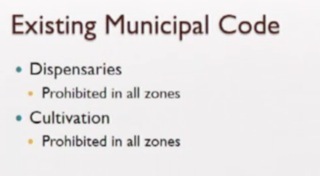 At one point Monahan argued with her from the dais - a completely irresponsible move on his part. A young woman named Nicole spoke of her organization which trains alcohol servers so they know how to manage serving to folks who have had too much. Interestingly, Monahan asked her to contact him... read into that what you will. Robin Leffler referred to Drain's video clip and her message, then did a recap of the last two elections in which neigher "side" won a mandate, but the current majority acts like they did. 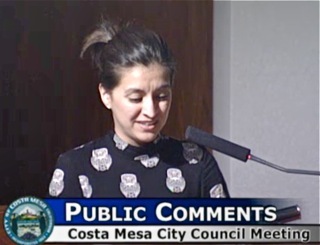 She also asked the councilmen to PLEASE NOT interrupt speakers. 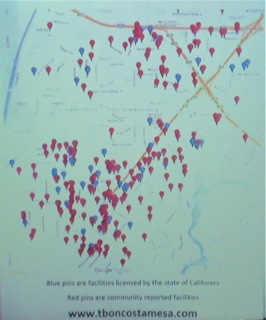 A woman who identified herself as "Jaws" presented a discussion about sober living homes and showed this chart, on which the blue marks indicate the state-licensed sober loving homes and the red dots indicate the resident-identified homes that the city doesn't have in their records. Big problems with sober living homes these days. 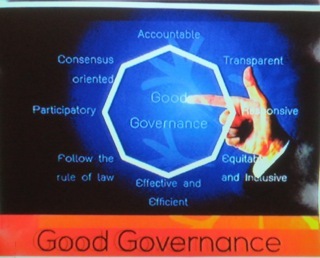 Another unidentified person gave her latest lecture to the council on Good Governance and showed an image of T-shirts that will soon be available. This is actually a waste of time, since they don't care a whit about what anyone else thinks. 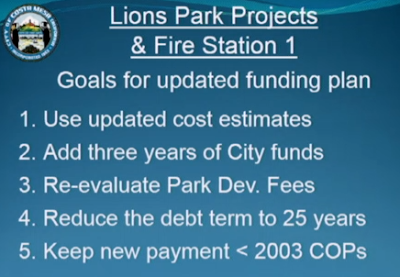 Then came Council Member Comments and Mensinger decided he was going first. He spoke about his "Meet The Mayor" gatherings - it is campaign season, after all. 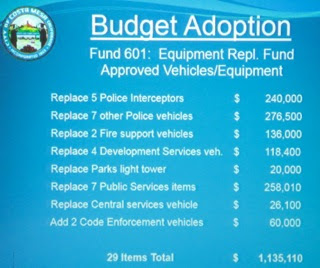 He bragged about having the 5th balanced budget in a row - but didn't mention our inability to get enough cops to keep the city safe. He said, "We need to be respectful" - and I gagged. 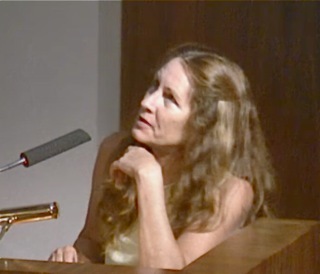 He mentioned yet another resident - Tamar Goldmann - who was not in the auditorium. He talked about the "Crusade to make up stories" - did I mention it's campagn season? 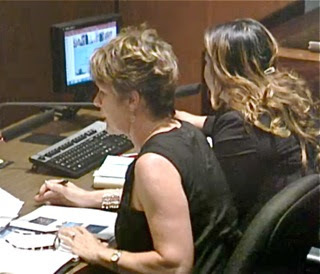 Sandy Genis spoke about a special event at a local school, then asked about the evaluations for the CEO and City Attorney, which, apparently have not happened during her tour on the dais. She also corrected the record about a "sport complex" at Fairview Park - citing an incident where it was, indeed, mentioned. 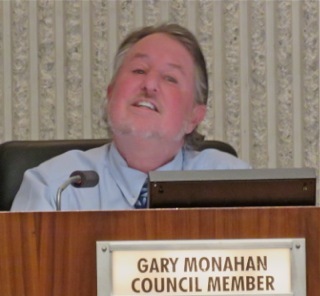 Monahan said he was a little distracted (by me taking his photos - see above), then mentioned the ironic burglary at his gin mill where contributions for the homeless were, apparently, stolen by some homeless folks. He also went off on a riff about the feasibility study for lights and other improvements at local schools. Then he whined about being criticized about sober living homes - he said, "We get beat up all the time up here. "- then said our ordinances are the strongest anywhere. Fine, but they're still creating big problems in our neighborhoods, Gary! Next up was Righeimer, who launched his monologue with this, "It hurts my heart to see some people so upset." He later said he'd pray for them, that they needed some help. So, apparently those of us who are critical of him and his actions are really in need of spiritual guidance. What a sanctimonious, arrogant clown! Just why do you think folks are upset? It's all about YOU, Mr. Mayor Pro Tem! He further endeared the audience to him by reiterating his view that if you can't afford to live here you should somewhere else. He said Orange County is only 1% of the population of the country - 99% live somewhere else. The then complained about people expecting "magic" subsidized housing. On Sober Living Homes, he said, "I've been working really hard." And he told us we have the best ordinances anywhere. He reminded us that Obamacare is creating this problem by paying for the sober living services. He closed by saying "It's all about the money." - quite an ironic comment when you think about it. They remembered to let CEO Hatch speak for a change, and he addressed the Fireworks issue, and mentioned 17 bullet points on their safety plan. He encourage folks to call the non-emergency number - 714-754-5252. The Consent Calendar was next. Four items were pulled - #2, #5, $7 and #8. As is usally the case, because the meeting ran late, some of those who pulled items for separate discussion had long left the auditorium... another success for the Mayor - discouraging public discourse on important issue. 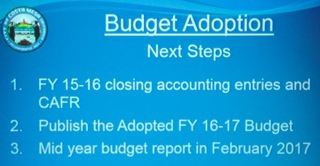 Public Hearing #1, the Appropriations element of the budget process, moved quickly and was passed, 4-0. 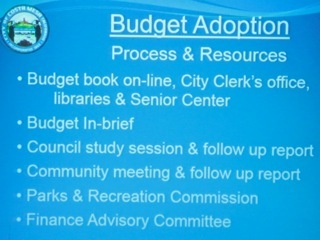 Public Hearing #2, the Budget itself, took longer. 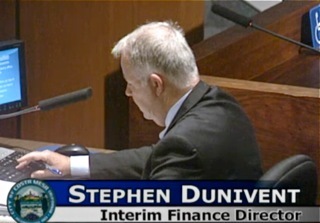 Interim Finance Director Steve Dunivent guided the discussion. I'll let his slides speak for themselves. I think you can read them. During the discussion Hatch reminded us of the need to be diligent about cost savings because 47% of our money comes from Sales Tax - the most volatile element in an economic downturn. 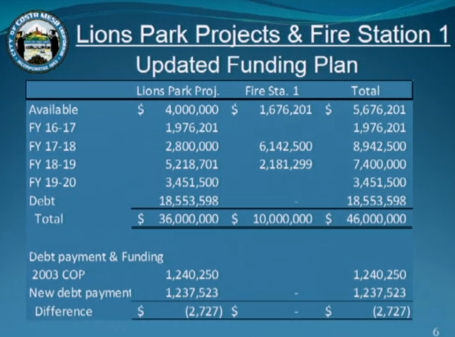 He also reminded us that our goal is $55 million in reserves - we're at around $52 now. Robin Leffler said she was happy to see no more deficit spending and observed that we were planning to bite off a huge amount of public debt for the new Library/Community Center/Lions Park improvements. She suggested it would be better to save for it and pay as we go. Righeimer said the staff did "a phenominal job", then went off on a tirade about how the city "blew through" $30 million in reserves - failing to give credit to the previous administration that had the foresight to accumulate more than $70 million in reserves for specifically that kind of catastrophic economic event. He touted that we have 200 fewer employees - but failed to mention that many of the services we expect and require are not keeping up with demand. He failed to mention that we're bleeding employees due to the draconian contracts they've imposed. In his own classy way, he said, "Our job is not to be a payroll service to pay a lot of employees". 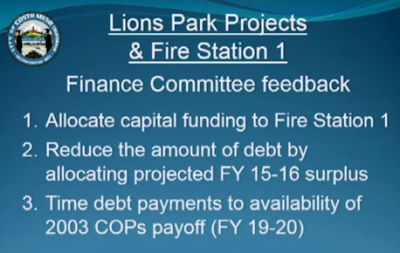 He then told us that many neighboring cities are in dire financial straits and that "we're in phenominal shape." There's that word again. 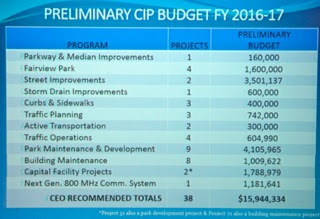 Eventually, after more discussion, but not as much as one might expect with a municipal budget of $144 million (a 6.2% reduction from the previous year), the council voted to approve the budget, 4-0. It was now 8:00 p.m. and the evening was just getting started. 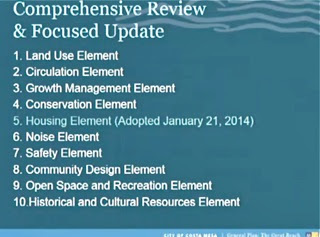 Public Hearing #3 is the 2015/2035 General Plan and Environmental Impact Report. This process has been going on for four years and I, for one, am getting tired of this process! 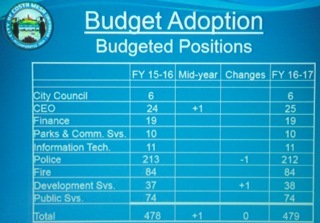 I know it's important, and I know public input is critical, but one gets the impression after attending all these meetings, workshops, etc., that this council majority is going to do what it darn-well feels like and chart a course for the next two decades in THEIR model - development, development and more development. 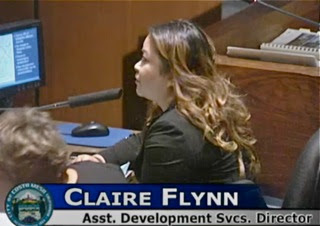 Assistant Director of Development Services, Claire Flynn, took the helm on this presentation. Participating with her was Consultant Laura Stetson, who has had a major role in this process from the beginning. 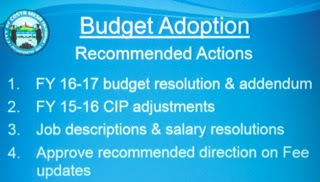 Here's the slide presentation that was followed during Claire's presentation. 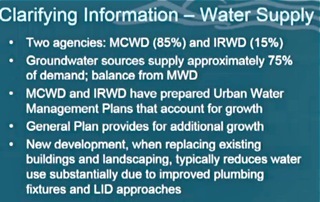 Stetson spoke about a previously-expressed concern about the water situation. Her slide explains that issue. Not unexpectedly, 21 people spoke on this issue. 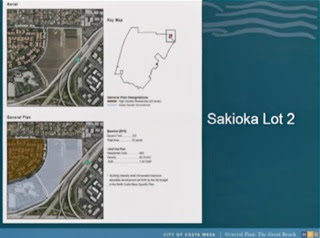 Teresa Drain spoke about 125 E. Baker Street and Jay Humphrey also addressed similar potential developments. Righeimer and Mensinger both interrupted him. 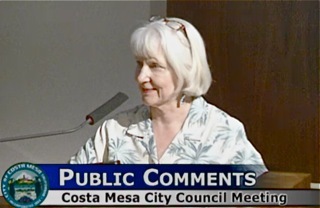 Sylvia Hatton, Linda Teng, Diane Russell, Kathy Esfahani, Steve Dzita, and others spoke at length and with great passion about the need for affordable housing in Costa Mesa and the potential legal quagmire that may await the city if we don't address this issue seriously. Steve Lemott, representing the Building Industry Association, expressed the view that we needed more homes because the housing stock - and the population - is aging. 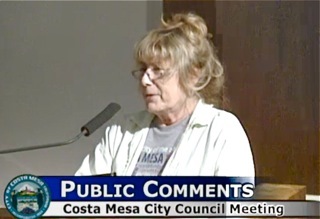 Wendy Leece observed that no mention is made in the documents about the Banning Ranch - a development that will certainly impact Costa Mesa in the not-too distant future. 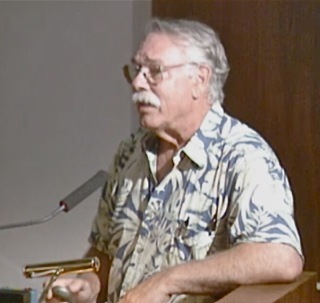 Jim Kerins - remember him? 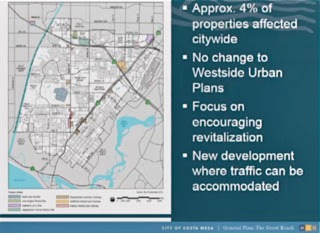 - said high density housing is a good thing, and again hinted that us older folks are impeding progress. 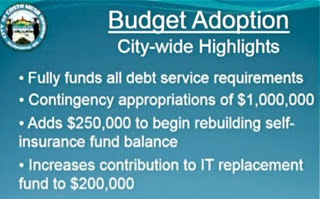 Righeimer went off on another rant - I've lost track by this time - and included a riff on the $20 million dollar bond he proposed for affordable housing and on and on and on. Finally, he said, "I won't say anythng anymore because I'll regret it in the morning." Well, it's going to turn out to be afternoon, but that's my fault. Genis went through a list of things she felt were still problematic with the General Plan and the EIR. 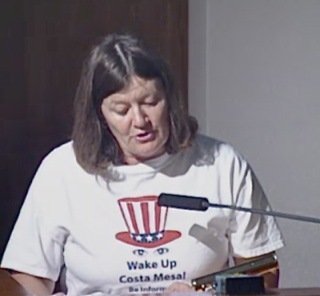 She worried about the health impacts and felt the water issue was still not sufficiently addressed. 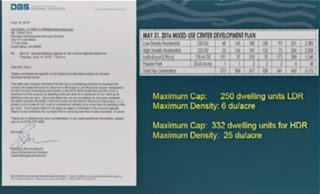 She was concerned about noise - the cumulative impacts of individual developments. Monahan told us he was embarrassed! He was ashamed of Genis' nit-picking and apologized to the staff - as if that was his responsibility. 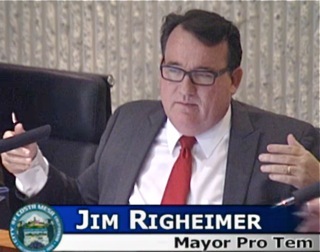 Mensinger told us Righeimer knows more about affordable housing than anyone in Orange County. He then specifically addressed Esfahani, chiding her by saying "That might work in the 60's, but not now.". 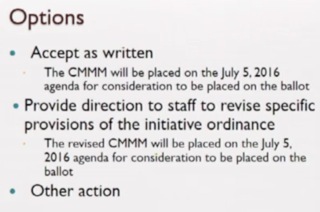 The staff will bring this issue back for a vote early in July. New Business #1 was the selection of a new Senior Commission member, replacing Stella Adkins, who resigned. There were seven (7) candidates. 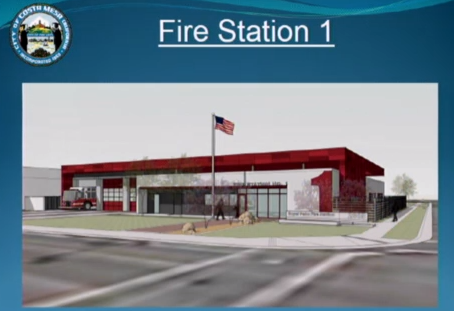 City Clerk Brenda Green described the process and read the names of the applicants. Monahan had the first choice and he nominated Lee Ramos. The vote was 4-0. It took about as long to finish that item as it did for me to type it. 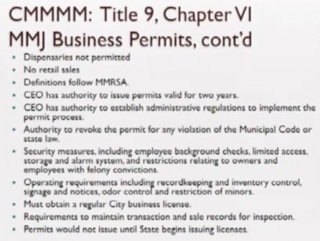 During the process Mensinger said he wanted to increase the number on that commission from 7 to 9, which will have to happen at a subsequent meeting because the issue must be agendized and a separate solicitation must be made for the additional two slots. New Business #2 was the updated funding plan for the Lions Park Project (Library, Community Center) and the rebuild of Fire Station #1. These projects have ballooned to $46 million. 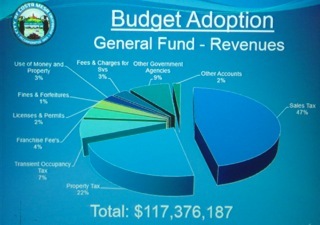 The charts indicate most of the information. 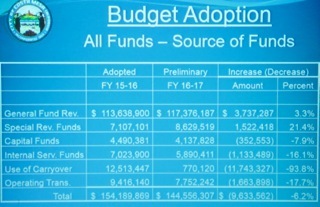 Hatch told us that the Finance Advisory Committee has recommended that whatever surplus the current budget shows should be applied to these projects. 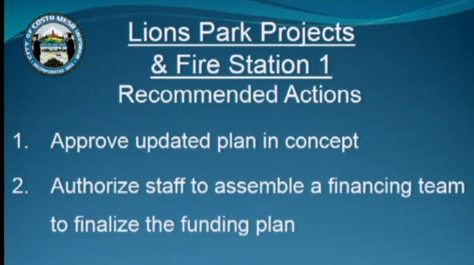 The council passed the recommended action, 4-0. 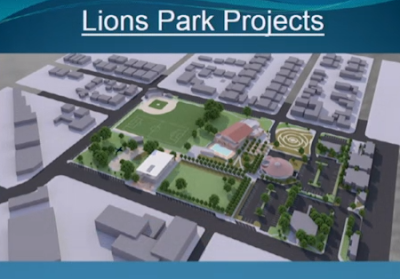 Next up was New Business #3, the so-called Fairview Park Initiative. 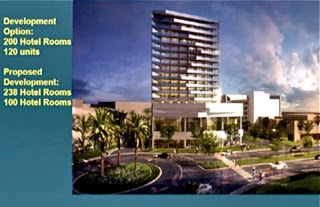 This initiative has qualified for placement on the ballot. The council can just adopt it as it is written - an unlikely event. They must move to place it on the ballot at some point. They moved the first part of the initiative - accepting the certification of the Registrars numbers. Eight people spoke to this issue. 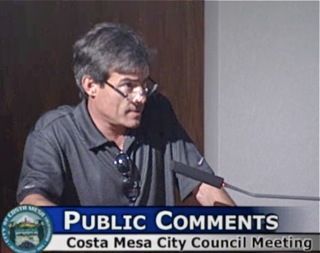 Former council candidate - he garnered the fewest votes - Chris Bunyan, spoke against it. He mislead the council with his interpretation of the initiative. Mary Spadoni, Jay Humphrey, Kim Hendricks, Robin Leffler, Anna Vrska and Cindy Black all spoke in support of the initiative. Jim Kerins made a rambling pronouncement about having vineyards and the like. One of the low points - maybe the lowest of the evening - was when Righeimer asked Cindy Black if she was drunk as she spoke on this issue! He should have asked that question of the little fella two positions down on the dais. Genis moved to place the item on the ballot, but Righeimer withdrew his second after a discussion. 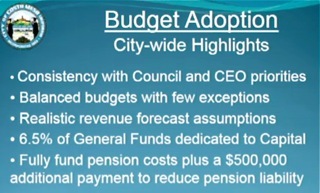 This issue will be placed on the ballot at a future meeting, after the council receives the two following items. 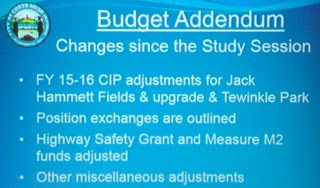 Righeimer moved item #3, the study of the issue. It passed 4-0. 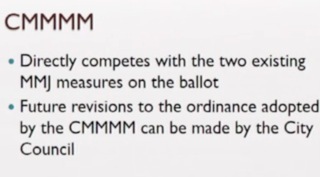 He also moved #4, which provides staff direction to compose a competing initiative to be placed on the ballot and yammered on and on and on. Genis defended the existence of the initiative by enumerating questionable things that happened in the recent past. 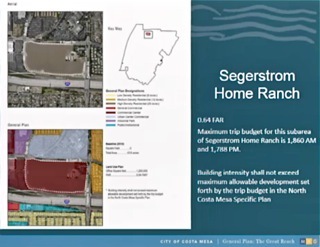 Mensinger said that Genis could no longer try to protect the park because she didn't accomplish that when she was last on the council in the 1990s. She set him straight. The vote was 3-1, with Genis voting NO. 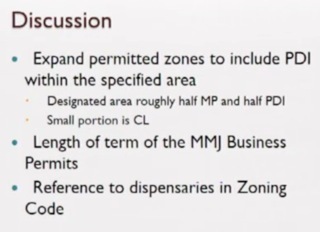 At a quarter past eleven the council began the consideration of the final item on the agenda, Consideration of a City Initiative Petition Regarding Medical Marijuana Businesses. 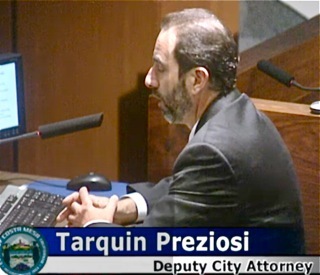 The discussion was lead by Deputy City Attorney Tarquin Preziosi. His slides pretty much cover the issue. 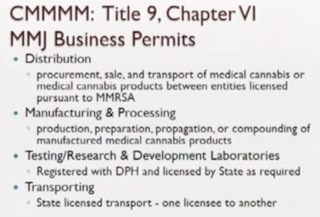 Three speakers addressed this issue, beginning with College Park resident Robert Taft, the man behind one of the other competing issues that will be on the ballot - the one with 8 dispensaries as part of his proposal. He was fully in support of our initiative. He said he will put his support fully behind our initiative because it does a good job of defining where manufacturing, testing and transportation operations in our city. 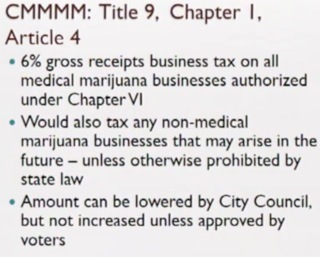 Currently sale and cultivation of medical marijuana is forbidden in our city. 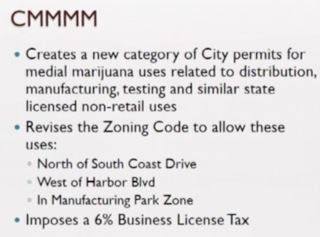 This initiative puts a 6% business tax on any such businesses and restricts their location to the northwest portion of the city. See the map above. 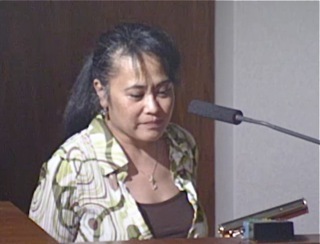 Joanne Perler spoke on the issue. She was apprehensive about it and wanted assurances about delivery. She was also concerned about the R&D element, indicating that the City shouldn't be involved in that. 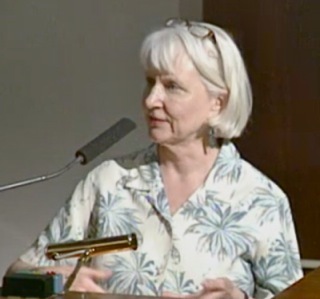 Robin Leffler spoke on it, indicating that she was happy with this ordinance. NOTE: Bleariness and missunderstanding caused me to give Robin Leffler's comments short shrift. She affirmed to me - and in a comment later - that she DID NOT support this initiative because of many questions she had. Please click HERE for the granicus fees, scroll down to the item - way down at the end, then click on Public Comment 3, which is Robin's, for clarification of her position. Righeimer said it needs tweaking - interesting play on words. (Genis wanted an insurance requirement included.) He wanted the staff to bring it back on July 5th. The council voted, 4-0. The meeting ended at the stroke of midnight. Ugh. If you want more details please visit the city website, HERE. Use the "jump-to feature to skip to the issue or speaker you want to hear more about. Was the little troll drunk again? Really? Flipping people off from the dais? What a class act - NOT! By the way, Geoff, you do know that Jim Kerins works for Mensinger, right? He's been hired to do the colors on the inside of his new mcmansion.. (Sure wish someone had been hired to fix the outside - its odd looking). Anyway, he's another "I got mine, to hell with anyone else" type of guy. Does he think the elderly should move out of town to make room for his ilk? Good luck with that. You ever notice that neither Righeimer nor Mensinger have professionals working on their teams? Instead, it seems both men prefer the younger, non-professional, and in at least two cases, unbalanced types. They can be easily led. Bunyan, in reality, is a hair dresser. Vogel, who knows? But he has a checkered past that I suspect would prevent him from being much of a success in the future. Mercurio, well, she doesn't stand on her own two feet much. I'll leave it at that. Its a sad bunch. And they chide the residents? 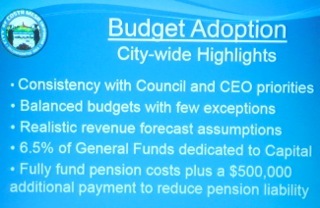 Righeimer is still harping on the previous council spending the reserves that they put away for a rainy day? When they needed it, it was there. That's why they saved it. How much has Righeimer cost us in legal bills? How much in lawsuits? How much in attempts at a charter? How much are these opposing initiatives going to cost us? How much have we lost in terms of public safety? The police department is biting pencils to keep them sharp. There is no air conditioning in the fire trucks anymore. Station 1 has no air conditioning whatsoever. When will the things that matter in this city start to become a priority? Enough of the high density to fill "someone's" pockets. We need other things taken care of. Public Safety should be our priority. Instead, its crumbling. All they want to do is go after prostitution to prove the motels are a mess. What about the real crime? People are being shot in the sober living homes. There are burglaries all over the city. There are children living in cars. CRIME IS UP 40%. Righeimer's office mate, Scott Baugh, lobbied to bring the sober living homes here. Now we are inundated. Righeimer has done nothing to alleviate that. His settlement agreement was a victory for the sober living homes, and a total loss to the city. Our safety personnel are skating on thin ice. Yet, we can buy boulders to stick in the middle of the street with signs to tell us where we are, lest we forget. 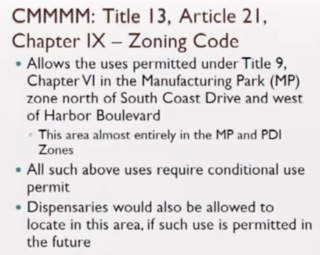 And Righeimer and Mensinger want to chastise the residents who dare speak out against these insane policies? They'd better get used to it. The numbers are growing. Thank you Geoff. Hope you feel better.Thank you for your recap. 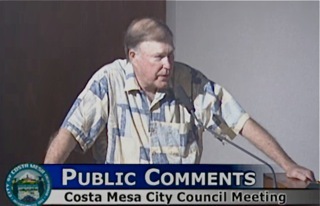 Many of us are sickened by the mockery of what used to be civil discourse in our council chambers. Rolling eyes, laughing, interrupting speakers, how ill mannered they are. Worst part was Mensinger's impatience with Sandy's list of reasons why she could not in good conscience vote to approve the General Plan/EIR. He was laughing, almost bored with it all,just waiting for her to finish. So immature and unbecoming of a public official. Well, we have work to do and miles to go before we sleep on Nov 9. I agree with Sandy. No one with a brain, or even half a brain, would approve that lousy error ridden piece of crap. We actually paid someone to do this? Kudos to Sandy for voting against it. 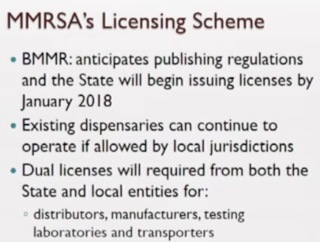 Until its right, it should not be approved. What is the reason they need it done this week? I guess we'll find out soon enough. Greedy Stevie thinks his re-election is assured. Has he spoken to the feds yet? I think the line of the night was directed towards the majority, something like 'I will continue to expect the least from those I held in the highest regard' This will be part of our carpetbagging mpt legacy. Geoff apparently typo'd. 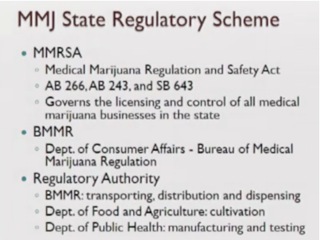 I am not for the MMJ factory initiative and had quite a few concerns. Robin, well I guess I'll have to pencil that guy off my list of contractors. I'm sorry, but that house is a conglomeration of leftovers. Looks like a ranch house made out of scraps, with an Asian style gate and a somewhat chain link fence looking driveway gate. The colors look like Disneyland. And that thing with horns hanging in the window just make me wonder.